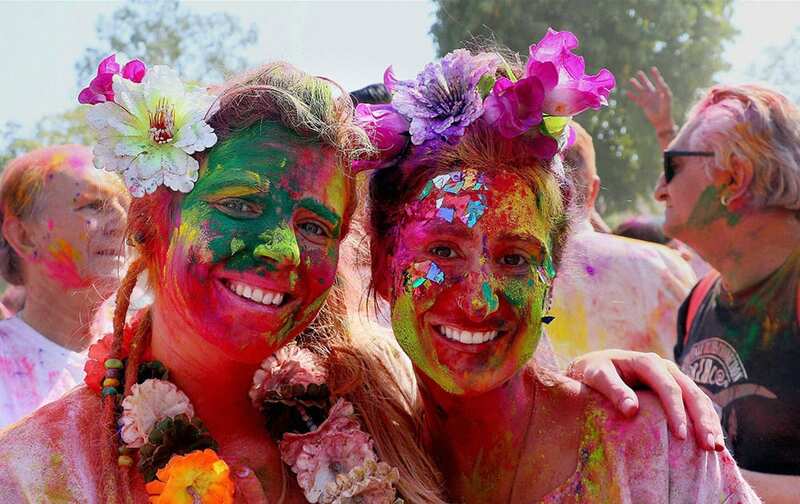 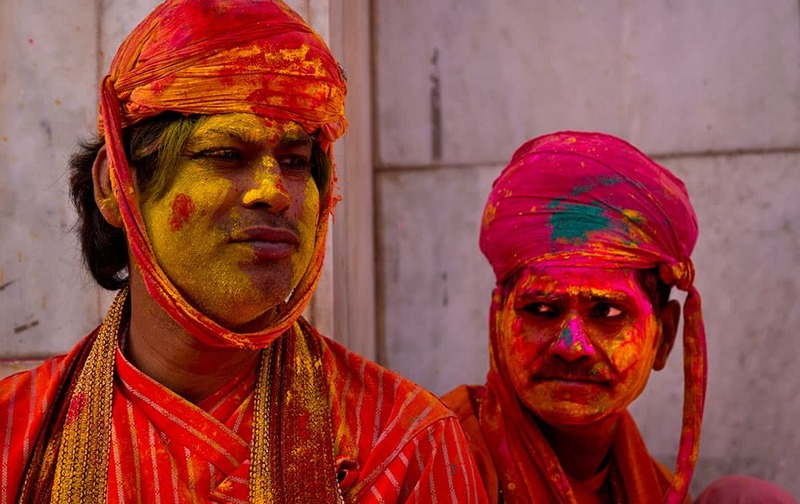 Foreigners celebrate Holi in Jaipur. 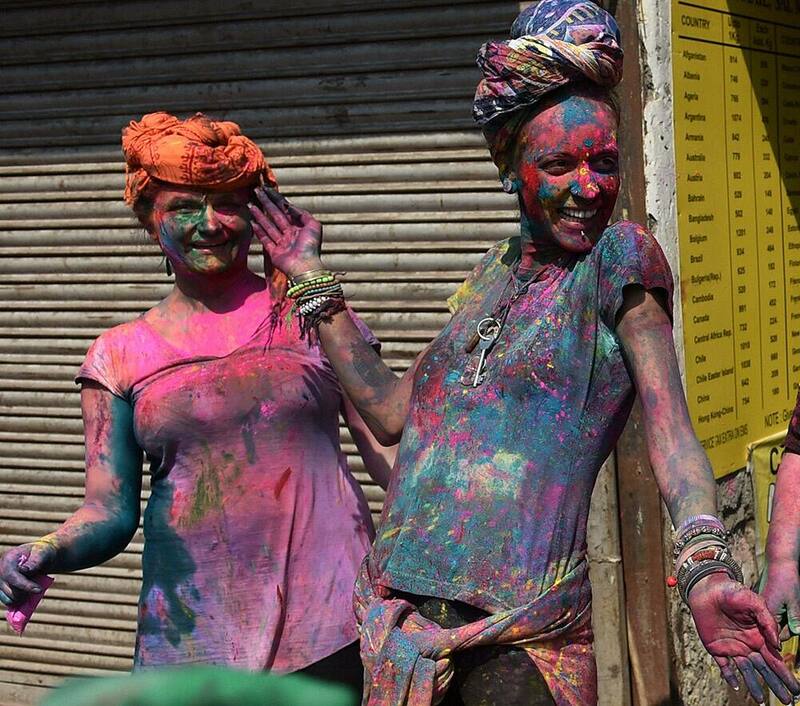 Foreigners celebrate Holi at Paharganj in New Delhi. 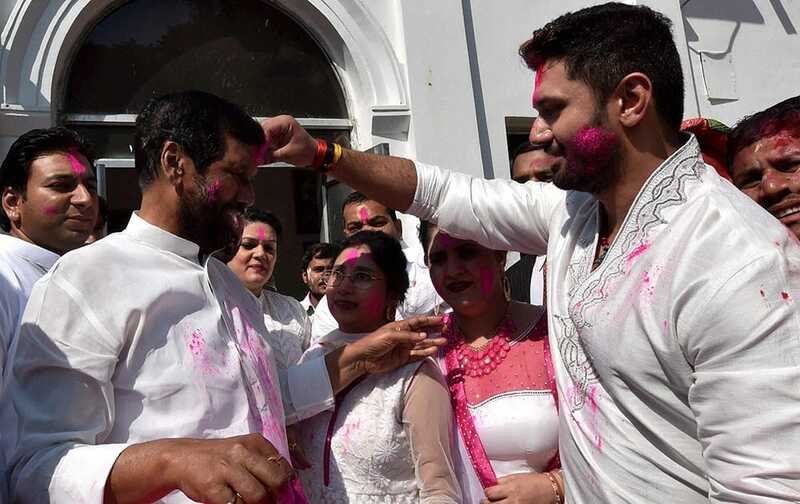 Lok Janshakti Party president Ram Vilas Paswan with his wife and son Chirag Paswan celebrating Holi at his residence in New Delhi. 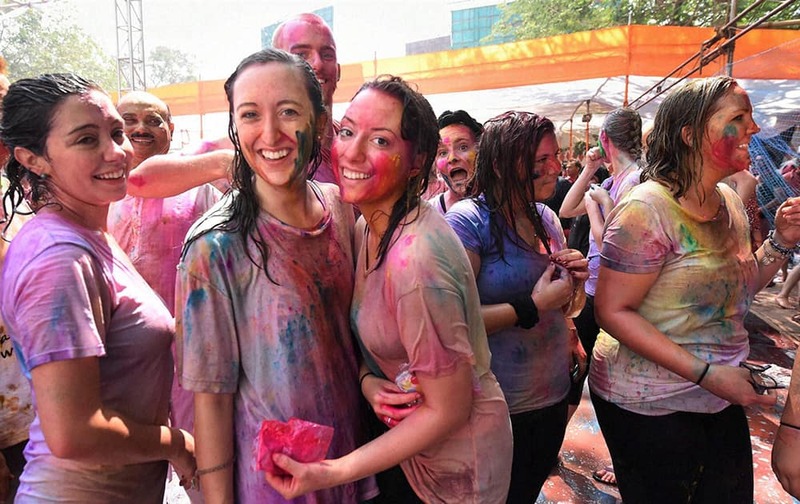 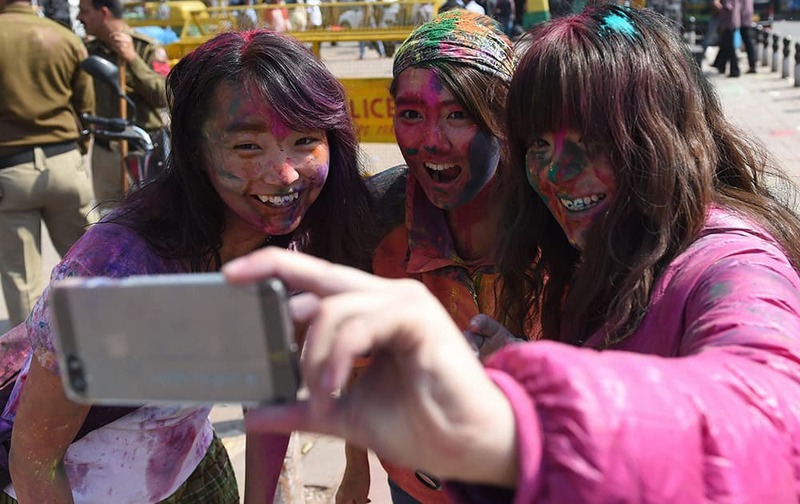 Foreigners celebrate “Holi ‘ in New Delhi. 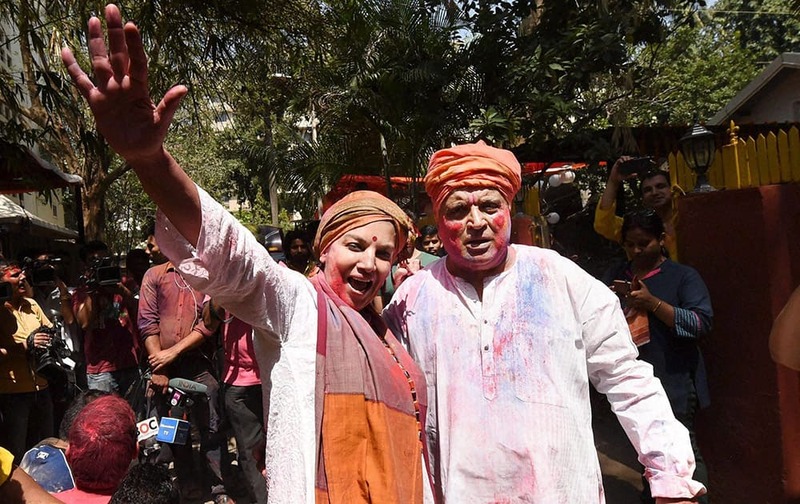 Shabana Azmi and her husband lyricist Javed Akhtar celebrate Holi at their residence in Mumbai. 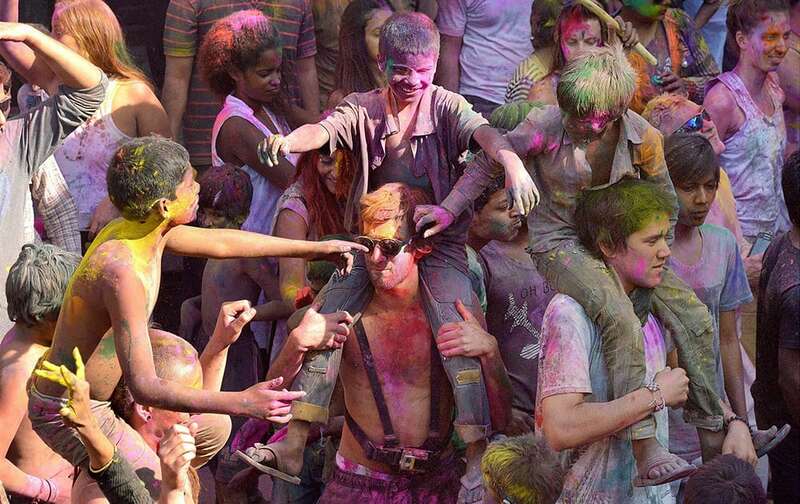 Foreigners along with locals celebrate Holi festival in Mumbai. 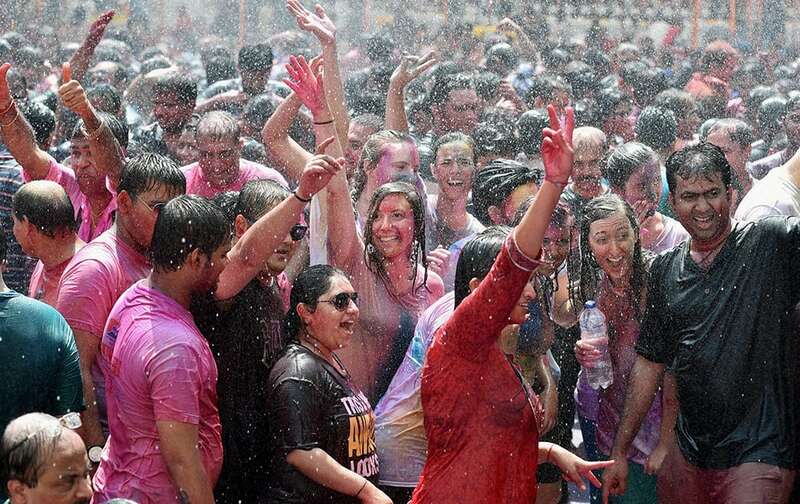 Foreigners celebrate Holi festival in Mumbai. 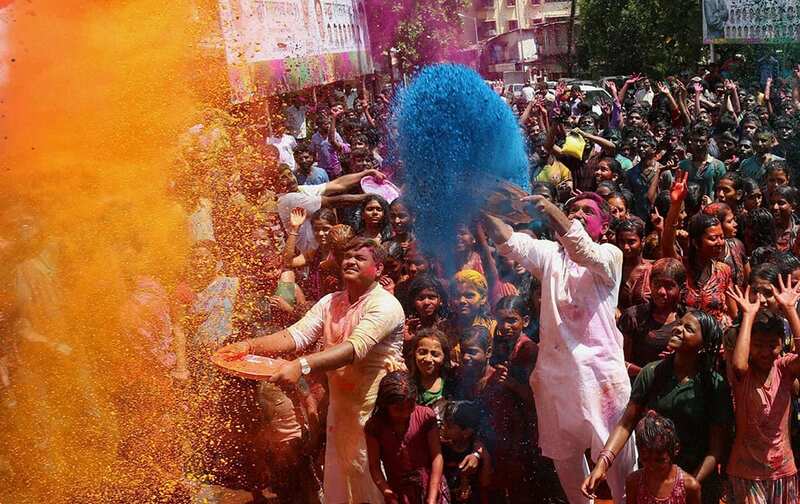 People celebrate Holi in Thane near Mumbai. 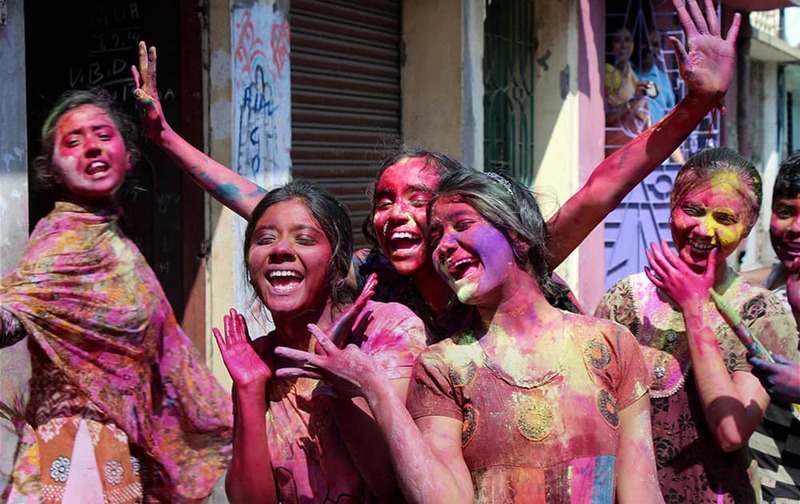 Young girls enjoy during the Holi festival at Malda in West Bengal. 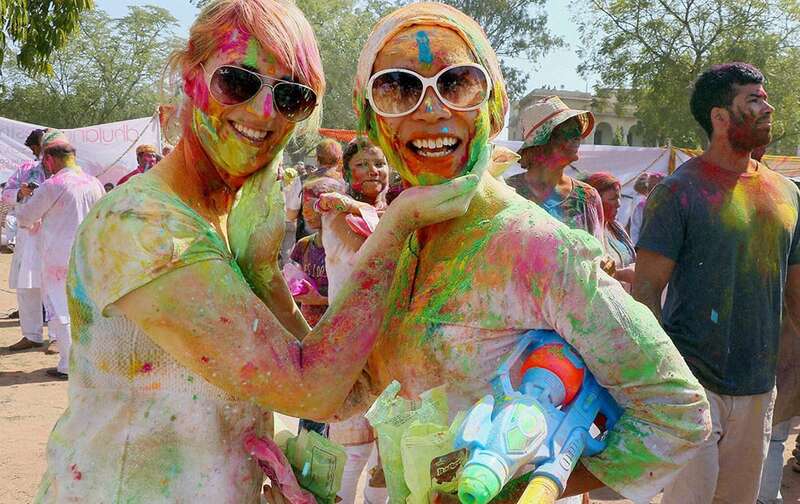 Foreign tourists take part in Holi celebration in Pushkar, Rajasthan. 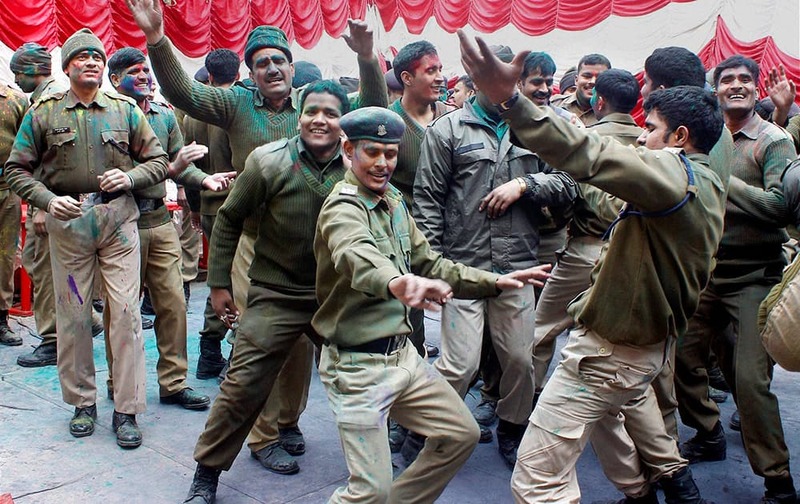 CRPF officials and personnel celebrating Holi in Srinagar. 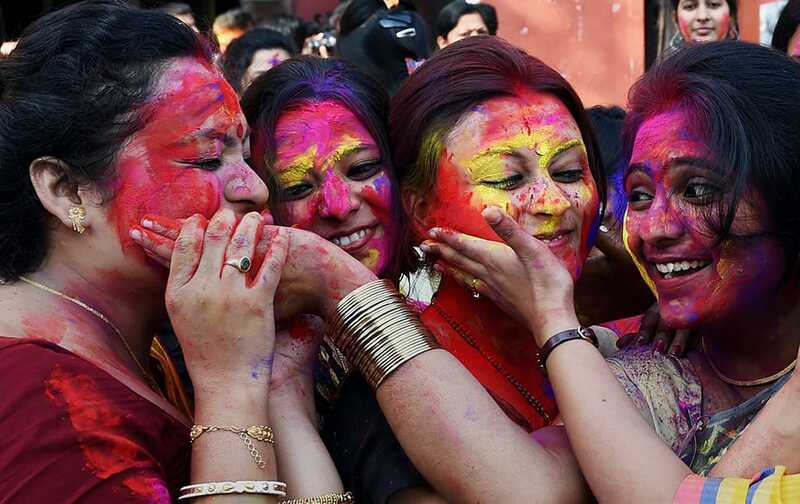 Family members of Border Security Force (BSF) soldiers celebrate the Holi festival at their headquarter in Srinagar. 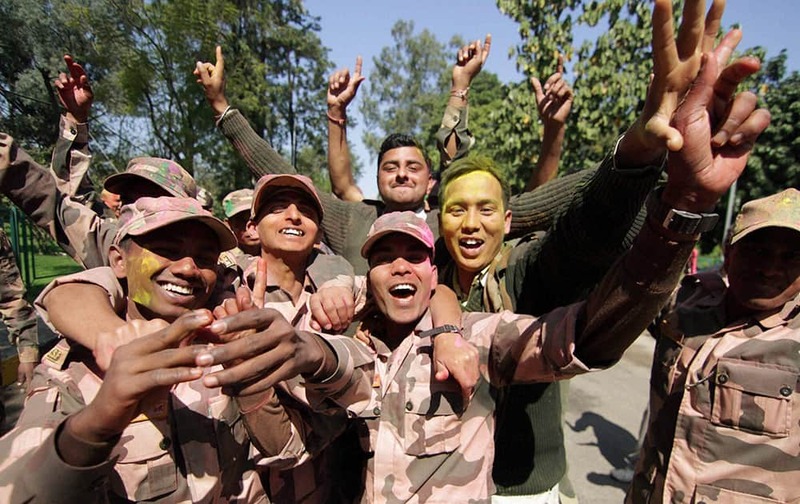 Border Security Force (BSF) soldiers dance as they celebrate Holi festival at Paloura in Jammu. 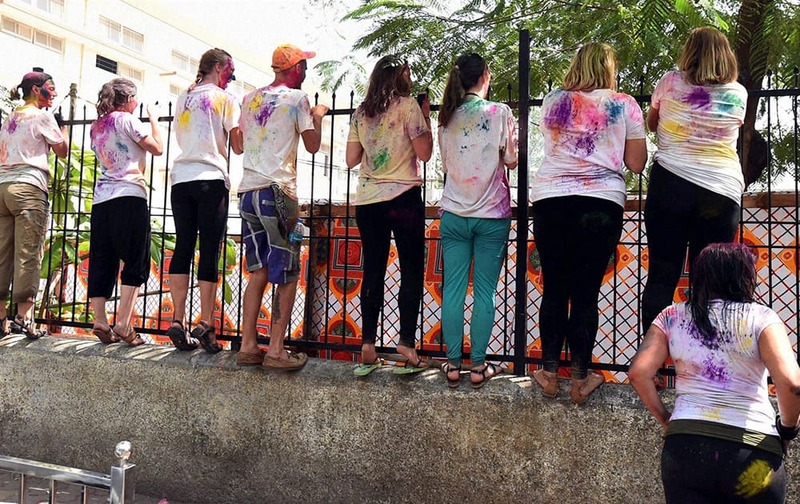 Girls throw colored powder on each other during Holi celebrations in Hyderabad. 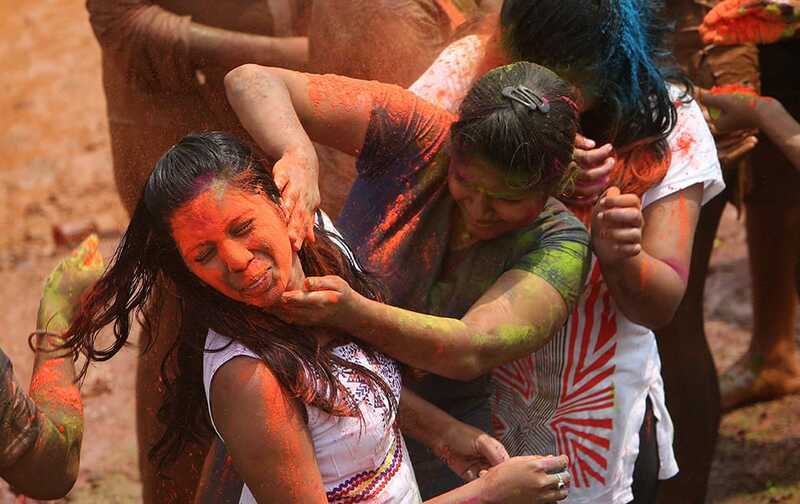 People put colored powder on the face of a girl as they celebrate Holi in Kolkata. 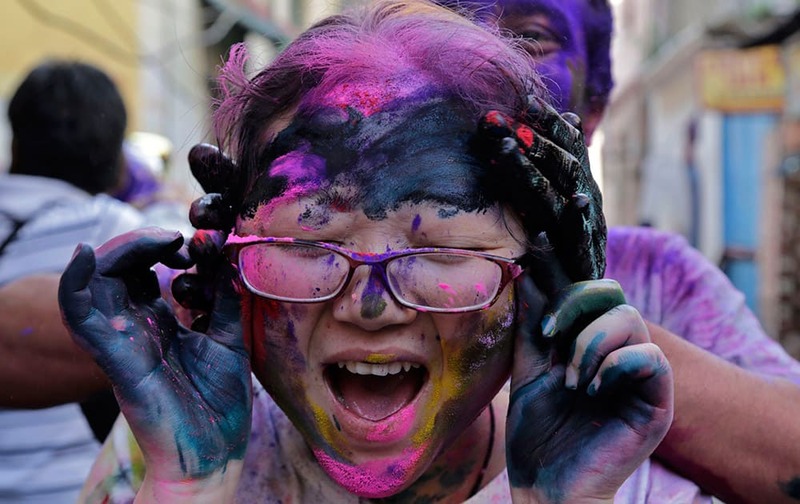 A foreign tourist screams as another puts color on her face during celebrations marking Holi in Kolkata. 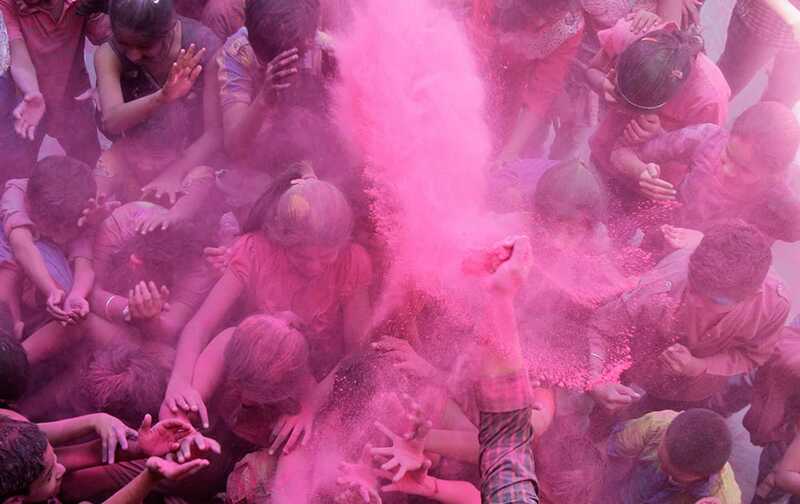 A teacher throws colored powder on school children during celebrations marking Holi, the Hindu festival of colors, at a school in Ahmadabad. 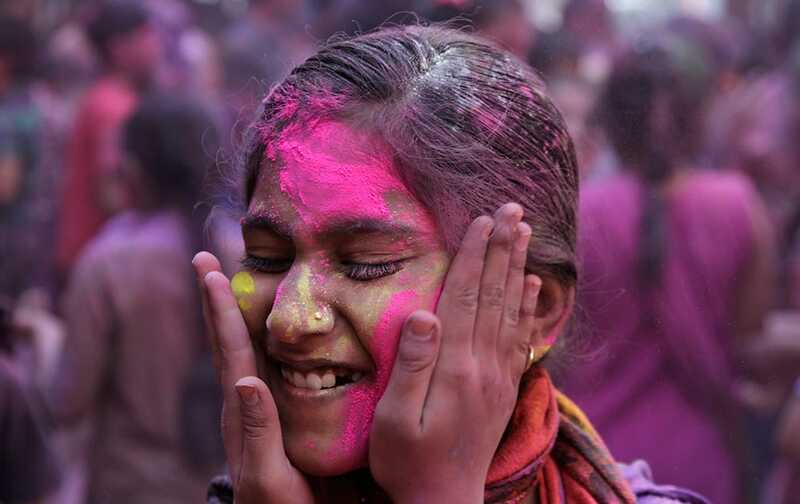 A schoolgirl closes her eyes as another applies color on her face during celebrations marking Holi at a school in Ahmadabad. 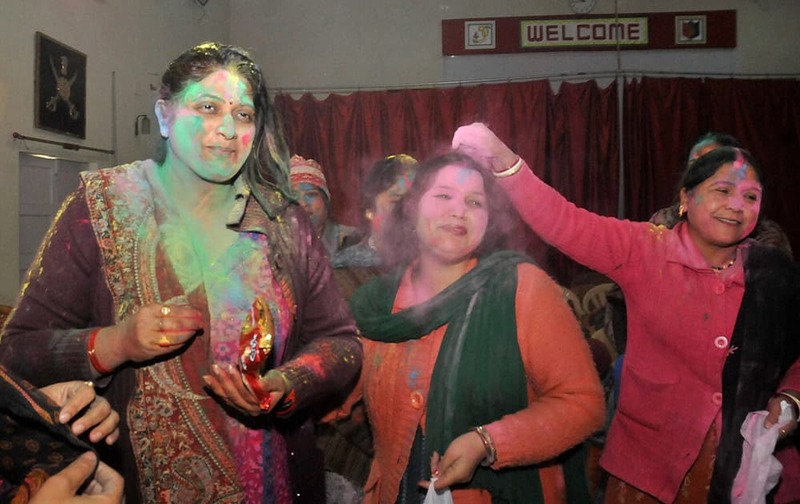 Union Science and Technology Minister Harsh Vardhan celebrates Holi with Delhi BJP President Satish Upadhyay and party leader Shazia Ilmi at the party office in New Delhi. 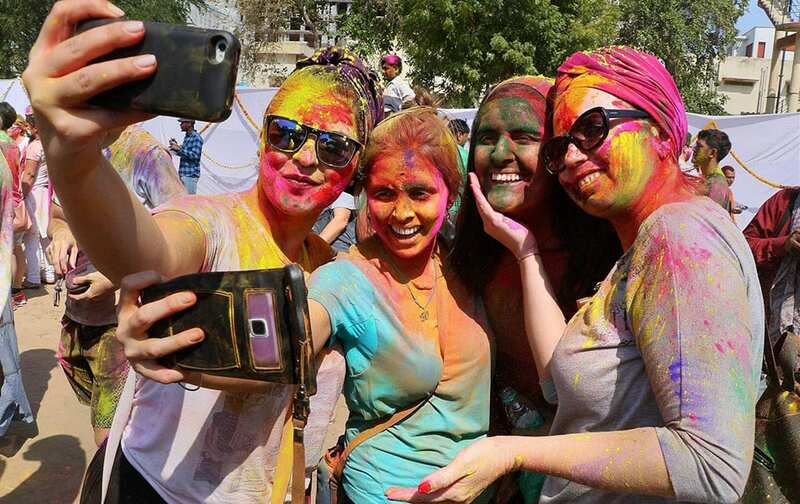 Students of Rabindra Bharati University celebrate Holi in Kolkata. 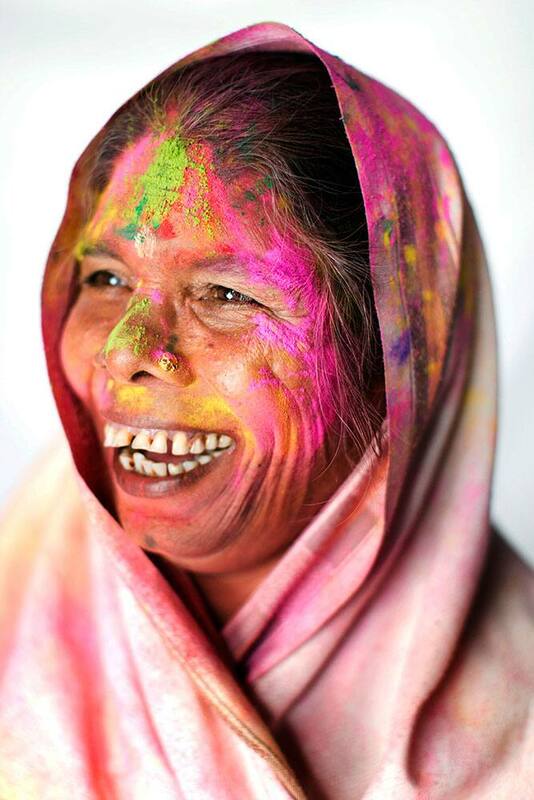 Hindu widow Uma, 65, poses for a portrait after celebrating Holi, the Hindu festival of colors, at the Meera Sahabhagini Widow Ashram in Vrindavan, India. 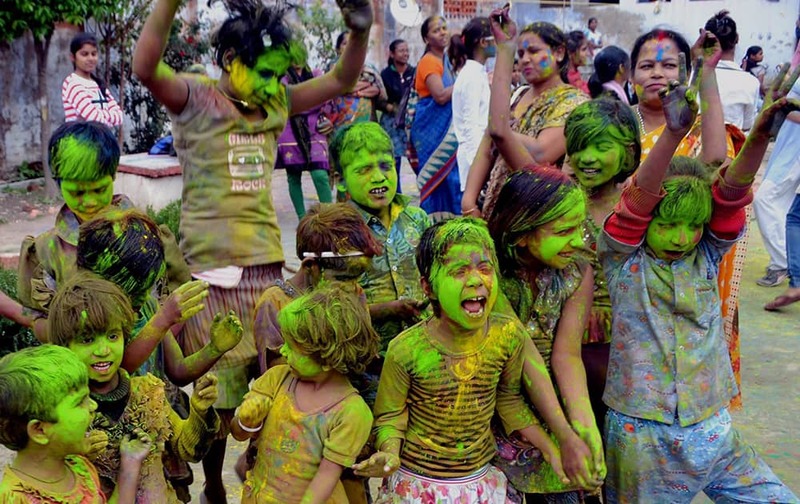 Children play with colours ahead of Holi festival at an orphanage in Lucknow. 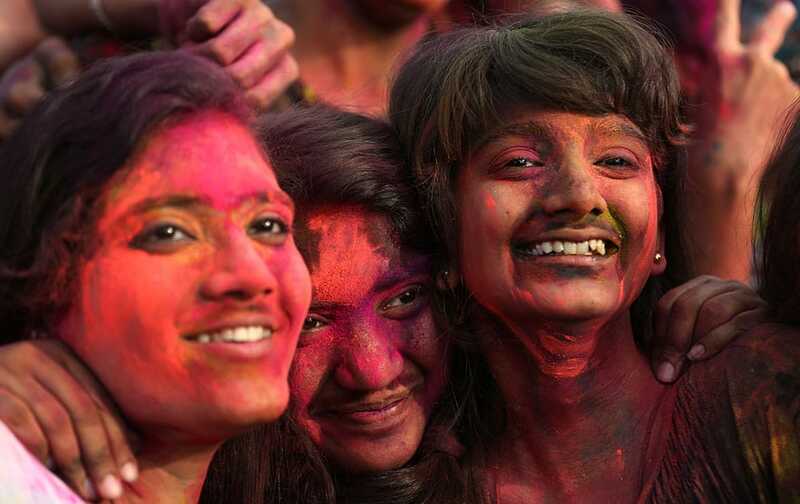 Indian nationals with colored powder on their face join celebrations of the Holi festival in suburban Pasay, south of Manila. 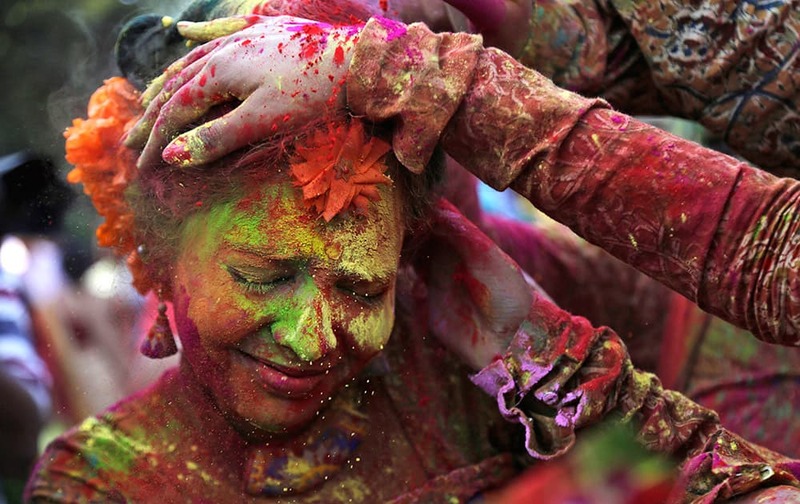 Participants place colored powder on a woman's face as they join celebrations of the Holi festival in suburban Pasay, south of Manila. 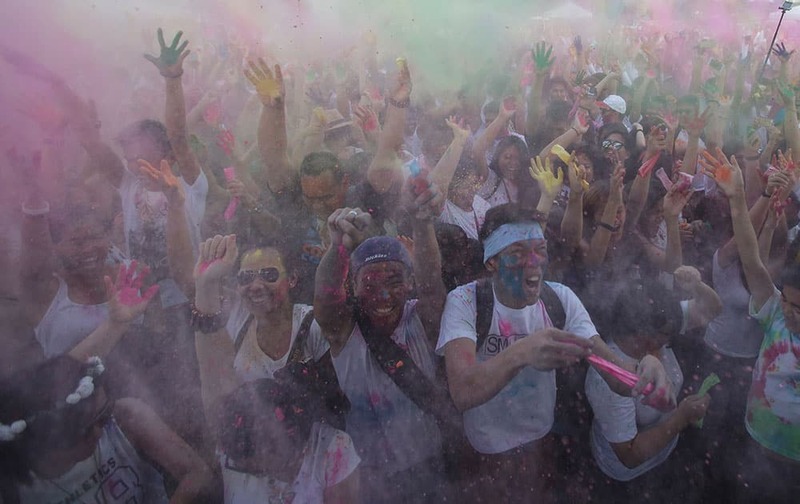 Participants throw colored powder in the air as they join celebrations of the Holi festival in suburban Pasay, south of Manila. 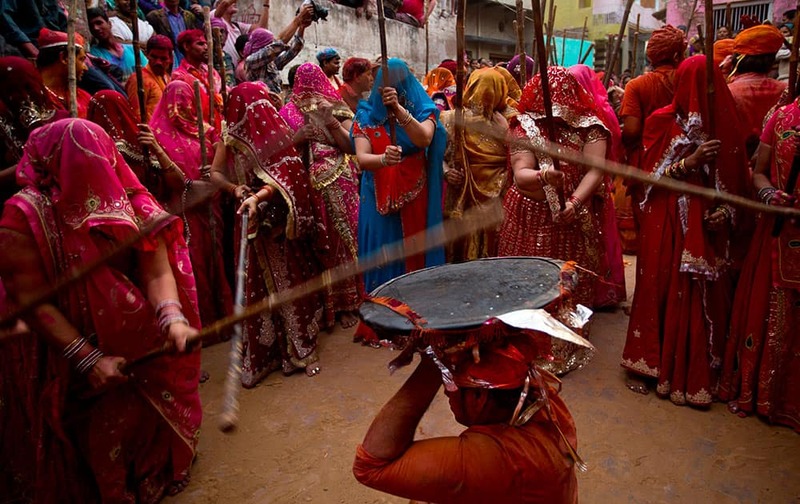 Women from Nandgaon village beat the shield of a man from Barsana during Lathmar festival celebrations in Nandgaon. 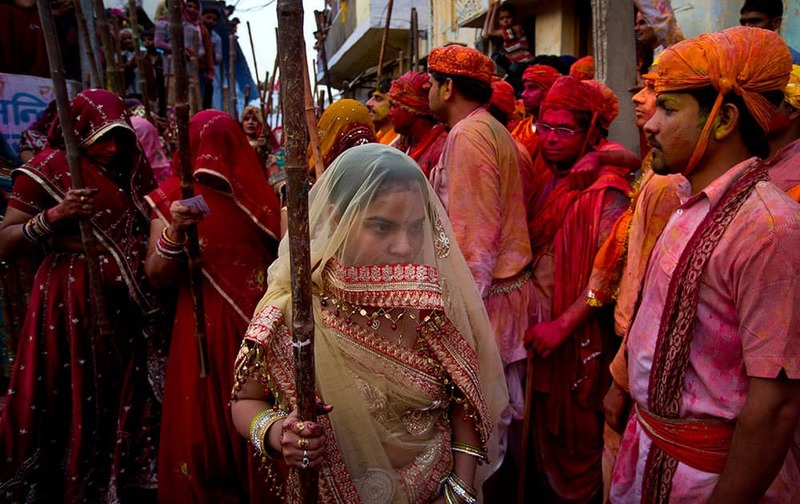 Villagers from Nandgaon wait for the arrival of villagers from Barsana at the Nandagram temple, famous for Lord Krishna and his brother Balram, during Lathmar holi festival, in Nandgaon. 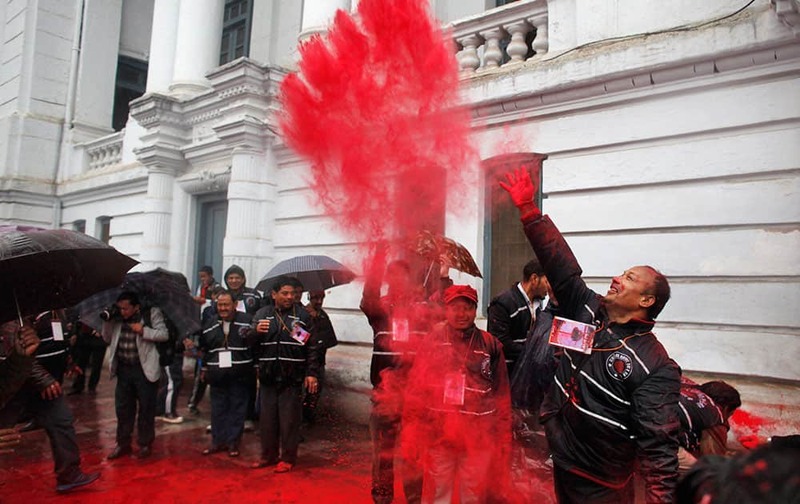 A Nepalese devotee throws vermillion powder after erecting Chir, a ceremonial pole, marking the beginning of Hindu festival of colors Holi, in Kathmandu.